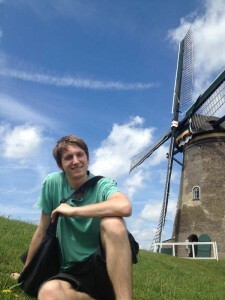 Meet Jurrien Theunisz in World Campus – Japan Program 2014! My name is Jurrien Theunisz and I’m from a little country in Northern Europe, namely the Netherlands. Some people call ‘The Netherlands’, ‘Holland’ and in Japan this country is known as ‘oranda’. Despite the many names, not much about this country, it’s language, it’s culture and it’s food are known to people from other countries in the world. This I kept noticing every time I traveled and I’ve enjoyed telling people about this little country. I grew up in the south of the Netherlands. I lived a fairly normal life. My views on the future and my future job kept changing as I grew up. In elementary school I got interested in exotic, weird, different, adventurous cultures and countries. Especially the adventurous and unknown attracted me. At this time my dream job was archeologist, discovering hidden temples and tombs in Egypt in search of culture, uncrackable languages and treasure. In high school this desire for the unknown and adventure shifted to the future instead of the past. I then sought adventure in science. I hoped to make discoveries in math, physics or chemistry leading to an interesting and maybe adventurous future. In the later years of my high school life I started meeting more people of different countries and regained my interest in different cultures and languages. I also had to think more about the future as I had to choose what I would do next. I made some contacts that introduced me to Japanese language and culture through pop culture and ended up really interested in both. Instead of an unlikely scientific discovery, leading to adventure, I decided to try my luck in Japanese language and culture. After high school I started studying Japanese in Leiden University. The city of Leiden is a lively student city with many bicycles and Cannels. There are many student associations and as such many activities to do. From extra readings to supplement one’s knowledge to All-you-can-drink beer drinking nights that have the opposite effect. Japanstudies in the university offers a variety of subjects teaching Japanese culture to students and the language program is quite big as well. I really enjoy studying in this university. More practical forms of the Japanese culture can also e experienced through the student association of Japanstudies, Tanuki. Tanuki has a Yosakoi team and it’s own soccer team. They also give workshops in Calligraphy and sometimes extra lecture. Me, myself am part of the Soccer club, called Banzai. We often train together with Japanese exchange students and sometimes play against Japanese players giving us a good opportunity to meet Japanese people in a fun setting. Previous PostMeet Maki Honda in World Campus – Japan Program 2014!Next PostMeet Espen Auseth Nielsen in World Campus – Japan Program 2014!